The cryobot thermal probe uses heat to melt through ice, rather than a drill to cut. Someof the most interesting places in our solar system are also the most difficultto reach. Areashidden under thick layers of ice such as the polar caps of Mars, Saturn'smoon Enceladus and Jupiter's moon Europaare prime examples. Drilling through ice on Earth is complicated enough, but onanother world the task becomes almost impossible. Thenotion of exploring thick sheets of ice isn't new. Probes built and used in the1960s were strictly Earth-bound, tested in places like Greenland and Antarctica, and the theory behind them was fairly simple. Along and thin probe penetrates straight down into the ice. A drill on the tipcuts through the ice, scientific equipment in the main body records data and along cable trails out behind, all the way up to surface equipment. Heavy andcomplex equipment is needed on the surface to provide the vast amount of powerneeded by the large drill, which rules it out for all but the most ambitiousmissions to other worlds. Adifferent and more modern method of drilling uses a hot drill tip to melt ice,rather than cut through it. Onesuch probe, called Cryobot,was recently tested in Antarctica. As the drill tip uses heat to melt ice, the probesinks deeper and deeper. Melting sounds good in theory, but if the probe hitssomething embedded deep in the ice, like a large rock, it will get stuck.Unable to melt through, the mission would come to an end. PeterWeiss is a scientist experienced in the field of sub-sea robotics. Togetherwith his colleagues from the Hong Kong Polytechnic University and the Institutfuer Weltraumforschung in Graz, Austria, he has devised a novel way ofcombining drilling and melting methods. The prototype "thermal drill"system they put together excelled in tests, as detailed in the July 2008 issueof the journal Planetary and Space Science. Armed with a series ofblades and heaters in the tip, the thermal drill could be the answer toexploring below the ice on distant worlds. Buthow does it work? Weiss explains, "Our thermal drill is like a 'classical'melting probe, equipped with two propellers that drill into the ice. Wemechanically open up the hole in the ice, and by this move the ice particlesbackwards where they will be melted. The slurry of water and ice will be pushedbackwards by the weight of the probe." Weiss'sthermal drill combines the best of drilling and melting techniques. "Oneadvantage of melting is that you can produce heat directly to melt through theice, so there are no losses due to the translation into mechanical power,"he says. 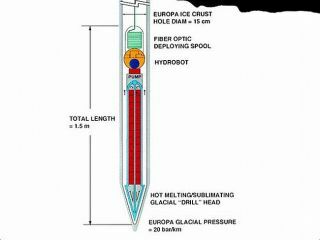 As for the drill encountering layers of dust or other material thatcannot be melted through, Weiss says that "Integrating a drillingmechanism will avoid your melting probe from simply getting stuck into a layerof sand while penetrating the ice - a scenario likely on the planet Mars,for example. A hybrid thermal drill will be able to penetrate even layers thatcannot be melted." Theheat created also has the useful side-effect of sterilizing the probe, an essentialconsideration when exploring places where no one has been before. Theenvironment should be kept pristine because contamination from the probe itselfcould ruin any experiments to such for certain chemistry or even signs of life.The constant production of heat also keeps the scientific equipment warm enoughin very cold environments to work effectively. Destined for the solar system? Manyareas of our solar system are ideal candidates for thermal drill exploration. SaysWeiss, "This study was done targeting the planet Mars and Jupiter's moonEuropa. But since then spectacular new knowledge has been gained on worlds likeEnceladus or even Titan where scientists speculate about sub-surfaceoceans." Weissand his colleagues have so far tested their prototype thermal drill using largeblocks of ice in a lab. Testing the drill under vacuum conditions to simulatealien environments is a logical next step. They'll also want to test just howdeep the probe could delve. Despitehigh hopes for the thermal drill, Weiss isn't sure whether one will feature onany upcoming probes. He says, "ESA and NASA were discussing a future missionto icy Europa, but it is uncertain if there will be a landing or impactingprobe onboard. But sending an orbiter without lander to Europa would be likegoing to a candy shop without bringing money to spend."